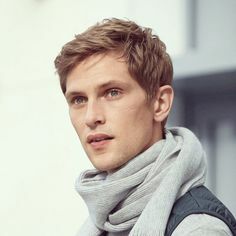 Mathias Lauridsen is a Danish male fashion model who has worked for brands including Christian Dior, Hermès, Calvin Klein, and Jil Sander. He has appeared in the editorials of popular magazines such as Vogue Italia, L’Uomo Vogue, Vogue Paris, Numéro Homme, GQ, GQ Style and Details. He has also worked with top fathion photographers such as Craig McDean, Karl Lagerfeld, Mario Testino, Hedi Slimane, Patrick Demarchelier, and Inez & Vinoodh. Lauridsen is currently signed with Ford Models in Paris, IMG in New York and Scoop in Copenhagen. Born on January 13, 1984 in Copenhagen, Denmark, Mathias started his modelling career at the age of 19, and signed with the Copenhagen-based Scoop modeling agency. He has been married to Zara Lou Zachrisson since 2014. *He was born in Copenhagen, Denmark on January 13, 1984. *He was discovered in 2003 at age 19, and is considered to be one of the best male models. *He ranked #1 on models.com Top 50 Male Models list for more than two years. *In 2014, Vogue named him as one of the top 10 male models of all time.